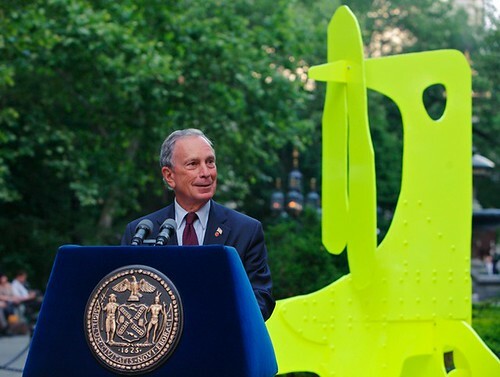 Mayor Bloomberg opens the Statuesque show in City Hall Park, standing before Aaron Curry’s “Yellow Bird Boy” (2010). Since Wednesday, an aluminum woman is joyfully resting in the grass of City Hall Park. Among her well-set figurative friends are a bronze giant, an octopus man, and a couple of luminous neon creatures. The new sculptures are part of The Public Art Fund’s yearly exhibit in the park, an ongoing project for more than 30 years with the aim of making visitors experience art more directly. Thomas Houseago, “Untitled (Sprawling Octopus Man)” (2009). The featured artists are Huma Bhabha, Aaron Curry, Thomas Houseago, Matthew Monahan, Rebecca Warren, and Pawel Althamer. Never displayed together before, the pieces all tend towards abstraction over realism, and texture over refinement of finish––some exuberant, many robot-like and other almost gruesome. “It is unfiltered, it is memorable and it is immediate,” chief curator and director of The Public Art Fund Nicholas Baume concluded. New for this year is a free cellphone audio tour via an iPhone app.